Firefighters work on a burnt-out oil storage facility Tuesday in Dalian, in northeast Chinas Liaoning province. Crude oil started pouring into the Yellow Sea off a busy northeastern port after a pipeline exploded late last week, sparking a massive 15-hour fire. BEIJING  Chinas largest reported oil spill emptied beaches along the Yellow Sea as its size doubled Wednesday, while cleanup efforts included straw mats and frazzled workers with little more than rubber gloves. An official warned the spill posed a severe threat to sea life and water quality as Chinas latest environmental crisis spread off the shores of Dalian, once named Chinas most livable city. Ive been to a few bays today and discovered they were almost entirely covered with dark oil, said Zhong Yu with environmental group Greenpeace China, who spent the day on a boat inspecting the spill. The oil is half-solid and half liquid and is as sticky as asphalt, she told The Associated Press by telephone. The oil had spread over 165 square miles of water five days since a pipeline at the northeastern port exploded, hurting oil shipments from part of Chinas strategic oil reserves to the rest of the country. Shipments remained reduced Wednesday. Greenpeace China released photos Wednesday of inky beaches and of straw mats about 21 square feet in size scattered on the sea, meant to absorb the oil. The oil spill will pose a severe threat to marine animals, and water quality, and the sea birds, Huang Yong, deputy bureau chief for the citys Maritime Safety Administration, told Dragon TV. We dont have proper oil cleanup materials, so our workers are wearing rubber gloves and using chopsticks, an official with the Jinshitan Golden Beach Administration Committee told the Beijing Youth Daily newspaper, in apparent exasperation. But 40 oil-skimming boats and about 800 fishing boats also were deployed to clean up the spill, and Xinhua said more than 9 miles of oil barriers had been set up to keep the slick from spreading. China Central Television earlier reported an estimate of 1,500 tons of oil has spilled. That would amount to about 400,000 gallons  as compared with 94 million to 184 million gallons in the BP oil spill off the U.S. coast. Chinas State Oceanic Administration released the latest size of the contaminated area in a statement Tuesday. 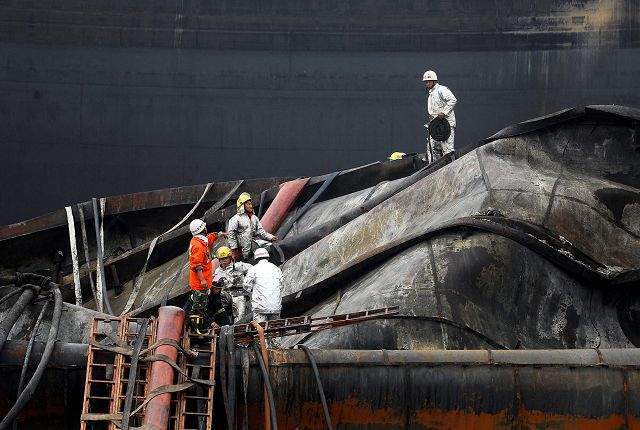 The cause of the explosion that started the spill was not clear. The pipeline is owned by China National Petroleum Corp., Asias biggest oil and gas producer by volume. Fridays images of 100-foot-high flames at Chinas second largest port for crude oil imports drew the immediate attention of President Hu Jintao and other top leaders. Now the challenge is cleaning up the greasy plume. Our priority is to collect the spilled oil within five days to reduce the possibility of contaminating international waters, Dalians vice mayor, Dai Yulin, told Xinhua on Tuesday. Some locals said the areas economy was already hurting.